When asked what the most important part of your home is, the foundation probably isn’t among the answers that first come to mind. Yet the foundation is more than a simple concrete slab or basement. It helps protect against storm damage, provides a barrier against burrowing pests such mice and termites, and bears the uneven weight of your home over a complete surface to reduce the effects of settling. 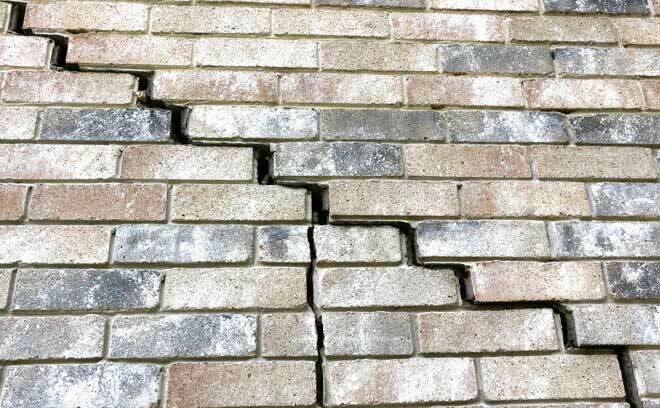 Problems with your foundation could lead to extensive structural and property damage. Older homes often had solid concrete foundation walls. Many homes converted from or incorporating garages use cinderblock walls. Modern homes usually use a reinforced concrete structure for their walls. While the latter is more durable and often better insulated, no foundation is immune to damage. No basement is completely waterproof. However, the common saying “If you have a basement in such-and-such community, you can expect flooding” is often limited to older communities due to poor foundation maintenance or location issues. For example, homes built at the bottom of a hill or bank tend to receive runoff water after storms and are more prone to sewer backups. In the event your basement is flooding and the house is level with or at a higher elevation than the surrounding property, it is best to check your foundation for erosion damage. Regular flooding or a constantly running sump pump may suggest the local groundwater table is level with or higher than your foundation floor. Check your local records office to learn more about the water table levels. Especially common among older homes in the more arid southwestern states, the ground under your property isn’t perfectly stationary. Soils which are full of clay or have not been properly compacted prior to construction may compress, expand, or even shift over time. A high water table may also increase shifting. Your foundation shifts or sinks in response to the underlying soil’s movements. A famous example of settling is the Tower of Pisa. Full foundation settling generally only happens within three years of construction, and has uniform cracking. Partial settling is more common and generally occurs when the fill soil under the foundation was not properly compacted. In the case of uneven settling, your foundation will begin to crack vertically near the sinking corners or even buckle. Doors and windows no longer fit properly, floors may begin to bulge or develop cracks, and additional cracks form in your walls. There are also visible signs on the exterior of your home, such as a cracked foundation or bricks, moldings becoming displaced, or the home leaning. Gaps might also become apparent around doors, windows, or between walls. Shifting soil creates similar signs with the added risk of the home moving from its original position. Usually, this shift is not easily visible, although major storms have been known to move houses several feet. An additional sign of shifting is newer additions or sidewalks no longer aligning with the main structure. Water is the primary cause of foundation damage. It is a contributing factor in both shifting and settling, and may also lead to erosion damage. Erosion occurs mostly from rainwater, but leaks in the sewer line or groundwater levels may also play a role. Large storms can overwhelm your drainage systems and raise the water table, speeding up the erosion process. Symptoms of foundation erosion tend to be more limited to your basement walls, unlike the erosion which causes shifting and ground expansion. In the event you are seeing chips or cracks in your exterior basement walls or the visible portion of the foundation outside of your home, you are likely suffering from erosion damage. Wall erosion leads to basement flooding and provides openings for various pests to enter your home. This form of damage may also contribute to mold which, in turn, will speed up the erosion process. It is therefore best to regularly check your foundation walls for signs of erosion and address them immediately. Pressure damage is caused from the weight of the soil bearing down on your foundation walls. The most common signs are horizontal cracks and buckling. 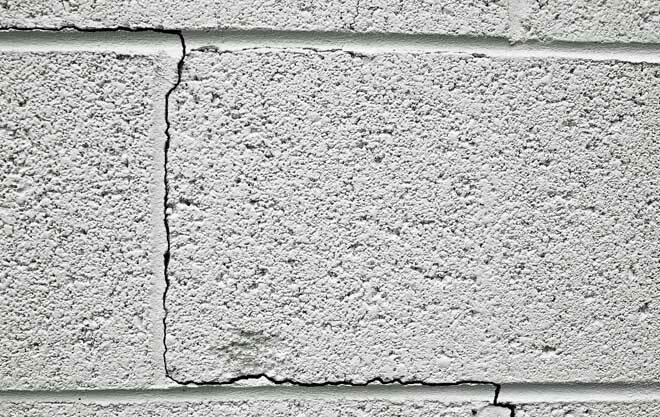 Cinderblock walls are especially prone to pressure damage, creating cracks along the mortar and sometimes displacing individual blocks or sections of wall. Several other factors may lead to damages in the short or long term. Tree roots may burrow into the foundation, contributing to erosion damage. Earthquakes cause the ground to shift suddenly, as do some major storms such as hurricanes. Poor quality concrete or substandard construction may also lead to a damaged foundation. Addressing a damaged foundation early on is often the difference between a repair job and having to completely replace the foundation. Depending on the type of damage occurring, it may even be possible to complete repairs yourself. Just as there are different causes of damage, there are varying methods of repair. There are numerous methods of addressing bowed walls, although these rarely solve the actual cause of damage. One inexpensive method which has proven effective is the use of wall anchors. During this process, a narrow trench is dug around the perimeter of your home. Earth anchor plates are lowered into this trench. Small holes are drilled outward through the foundation and steel connecting rods are inserted into the anchors through the holes. Finally, a wall plate is installed on the inside of the wall. The assembly is then tightened and the trench refilled. This method has a few distinct advantages over traditional braces and helical wall anchors. They are quick and easy to install. Additionally, periodic tightening over time may actually restore the wall to its original shape. This form of brace also helps prevent future bowing. Lastly the method is unobtrusive and may be completed within a day. Minor damage such as cracks and chips may be a sign of more extensive damage or aging. However, they are easy to patch. You will need to place a chisel in the freezer for at least half an hour prior to making repairs. Begin your work by placing the chisel at a small angle within the crack and tap gently. As cracks are only a small sign of larger internal damage, your goal is to chip a hole at least twice as wide as the opening. Remove any dirt or debris using a wire brush and flush the hole out using a cup of warm water. This may take up to a day to dry, during which time you may also scrub down chipped areas. Once the area has completely dried, mix some patching compound in a bucket according to the package instructions. Use a putty knife to grab an amount roughly the size of a golf ball and push it into the cavity until it is over-filled, then scrape even with the wall’s surface. Your final step is to cure the patch by sealing the portion of wall airtight with plastic sheeting and duct tape. Carefully open the top and add water using a spray bottle. Seal the area again and repeat this step every 24 hours for five days to ensure the patches are properly cured. Considered the more stable, yet more costly solution for settling, piering (also known as piling) requires your contractor to excavate below the sinking portion of foundation. The three foot by four foot excavation does not require heavy equipment and extends approximately ten feet below the grade beam. Next, the contractor will scrape away any dirt and chip away at the bottom of the foundation so that the support bracket fits properly. Then, the pier is installed. There are two common forms of piering, both of which require a long steel shaft to be driven through the ground beneath your home into a more stable layer. Helical piers are screwed into the ground using a hydraulic torque motor. Push piers are nailed into the ground using a hydraulic ram. Once the pier is embedded, it is tested to ensure it can bear pressures many time greater than the structure it will be supporting. A metal head assembly is used to attach the pier to the foundation, and a hydraulic jack raises the foundation to its original level. Once at the correct elevation, the piers are permanently affixed to wall brackets through either welding or bolting. Some repairs may require more than one pier, in which case the process is simply repeated for each individual pier. There are several advantages to piering. The process itself is largely non-disruptive and may be performed without evacuating the home. While the most expensive form of repair, it costs as little as ten percent of the cost for foundation replacement. Finally, piering is considered a permanent solution to settling. Used for slab foundations, slabjacking is a means to repair the sunken portions of foundation without replacing the entire slab. Several holes measuring between one point five and two inches are drilled into the affected slab. These holes are evenly spaced, usually between three and eight feet apart, depending upon the slab’s thickness. No holes are drilled within a one foot perimeter of the slab’s edge. Next, the holes are injected with a special mixture of sand; water; and either Portland cement, Bentonite clay, or stronger fly ash cement. This grout mixture usually has additives to prevent shrinkage. Pumping begins at the slab’s lowest point, and moves to another hole when the slab has raised approximately one inch. In some cases, smaller intermediary holes must be drilled and filled with a less dense mixture. As the cavity becomes filled, the grout pressurizes and lifts the slab to its proper height. Excess grout is removed from the holes which are then filled with a stiff mortar and smoothed over. Some contractors may offer to core the slab instead of drilling, which is slower and more expensive but less visible. In the event only a portion of the slab sank, any cracks are filled and smoothed over as a finishing touch. A newer alternative to the traditional grout mixture is a two part polyurethane foam. The components are delivered via hose and do not mix until they reach the nozzle. Within 15 seconds, the foam expands 20 to 25 times in volume and achieves its full strength within 15 minutes of setting. Cheaper, quicker, and less labor intensive, this alternative is suitable for a wide variety of projects beyond home foundations, from sidewalks to highways but may not yet be available in your area. Repairing your damaged foundation can be relatively inexpensive or very costly, depending upon the type of repair needed. Properly determining the source and extent of damage is therefore a vital part of your final expenses. Before contacting a contractor, you should invest in an inspection by a structural engineer. The inspection and report will cost between $300 and $800. This is a necessary step, as contractors may recommend a repair method based upon profit margins. In some rare cases, you may also wish to have a soil report from a geotechnical engineer, which ranges between $500 and $2000. Minor cracks or chips can be removed as a DIY project. This type of repair to a poured concrete wall will run between $400 and $800. Replacing the floor costs approximately 50 percent extra. At the other end of the spectrum, piering runs an average of $1,000 to $3,000 per pier. The Basement Health Association is a non-profit organization which offers a free locator form for certified basement repair specialists on their secondary website.